Window treatments serve multiple purposes. They add elements of style, help regulate temperature and lighting, and set the mood of a room. One popular window treatment that covers all of these bases is the roman shade. Roman shades are versatile in both style and function. Here, we’ll go over some of the highlights of this fabulous window covering. Because of the variety of material choices, roman shades can let in or keep out as much light as you like. Some act as gentle filters, softening sunlight and allowing it to sweep into a room. Others will block light more completely, giving the room additional protection from the sun. This option would work well in a nursery during naptime. You can also vary the amount of light and privacy with their unique top down bottom up option. In addition to the aforementioned features, roman shades can help regulate temperature as well. The Department of Energy lists roman shades among their recommended energy-saving window treatments. The layered material and optional liners insulate windows, creating insulation for windows. During the Texas summer, this works with deflection of heat and retention of that ever so valuable and costly air conditioning. In cooler months when trying to keep cold air out, roman shades work as a barrier keeping cold air out and heating bills down! No matter the style of your rooms, you’ll find roman shades can complement, blend into the background, or create a pop of interest. By playing with pattern and color, texture, and shade styles, you can create your own unique look for any room in your home. There are many different types of roman shades. Each has its own unique set of qualities. Here are several types of roman shades, along with their attributes and some ideas for inspiration. Flat roman shades are probably the most common type of roman shades. Unconstructed flat shades are made with a single piece of fabric and hang flat, without seams, pockets, or rods. These are unassuming and perfect for a minimalist look. Because of the flat surface area, they’re also great for fabric with large patterns. These are the perfect shades for a bedroom or living area to give a relaxed, casual feel with quality and stylish window treatments. These shades are unconstructed roman shades that fit either a casual aesthetic or can add elegance to any room depending on the material and color selected. When custom made with rich fabrics and colors, these window coverings can add an air of sophistication to a dining room or formal sitting room. Use a lighter, airy fabric and neutral color for a more casual look. 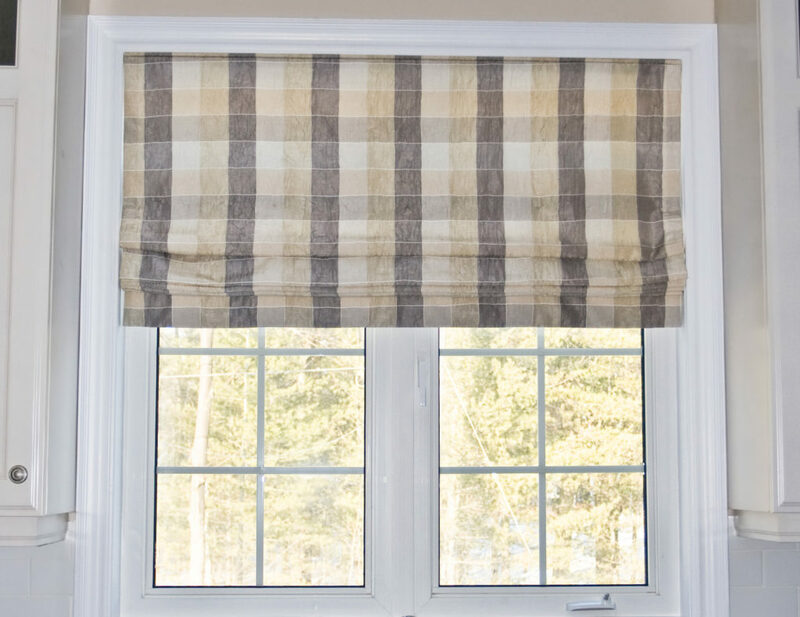 The European or relaxed roman shade style create a soft bow at the bottom when lifted giving it a unique style and identifying the reason for the “relaxed” name. Even though this is thought of as a classic roman shade, it still works well in with a modern decor. The clean lines and stacked folds give these window shades a streamlined look. The plain classic fold creates soothing lines and works well with solid colored fabrics or geometric patterns. The top down, bottom up option makes this a versatile choice, no matter which way you choose to let the light in. Roman shades are one of the most versatile window treatments out there. Whether you want a classic look, rich, elegant style or a more laid-back, casual feel for your home you can be sure there is a roman shade option to fit your design needs. If you’d like more information about our custom roman shades and what they can bring to your rooms, please contact us today! We’ll come to you for a free in-home custom window treatment consultation to make sure that you get the best results from the window treatments that you choose. We work closely with many Austin-area interior designers as well, so if you have a project that you are working on, get in touch with us for custom work that your clients will love!